The Institute of Volcanology and Geodynamics (Russian Academy of Natural Science) reported that during the morning of 31 July volcanologists working on Kudryavy, a stratovolcano of the Medvezhia volcanic complex, noted a sharp increase in the volume of vapor-and-gas emissions, with a plume rising more than 1 km. The emissions rose from a new crater, Malysh, that was formed after the 1999 phreatic eruption. A significant increase in temperature (an average of 100 degrees Celsius) was measured at fumarolic sites, and new high-temperature areas were noted. Crusts of native sulfur at the boundaries of high-temperature areas were melting and burning. Two people at the top of the volcano and workers at the main base camp (3.5 km S) self-evacuated. The report noted that a M 5.7 earthquake had occurred at 0800 that same morning, 200 km NE, within the same system of tectonic faults that the volcano resides on. The volcano has a permeable system of fissures, through which there has been constant degassing for more than 130 years. Figure 2. Photograph of fumarolic plumes rising from the crater of the Kudriavy cone at Medvezhia, September-October 1999. Courtesy of G.S. Steinberg. From the base camp, 3.5 km W from the volcano, black and gray clouds of gas and ash were observed rising above the usual fumarolic plumes at 1735 on 7 October and then extending ~10 km NW. Ejections of gas and ash occurred at intervals of 1-2 minutes. Because of the strong winds, maximum altitude of ejections was 1,100 m. The upper camp was at 940 m elevation, 30-40 m from the crater edge and 300 m from Hot Lake (figure 3). Because of strong winds, bad visibility, and the low-intensity start of the eruption, volcanic tremor and gas-and-ash ejections were not noticed in the upper camp until 10 minutes after observers in the base camp saw the plume. Night observations showed that intense ejections stopped at 0200 on 8 October. Observations through the clouds of the N part of the crater revealed "slight reddish lights - reflected light of the hot rocks and blue lights - light of the burning sulfur" that marked the edges of a crater. Figure 3. Aerial photograph of the N part of the Kudriavy crater at Medvezhia showing the locations of the upper camp and the new explosion crater W of the hot lava dome during 7-8 October 1999. North is to the left. Courtesy of G.S. Steinberg. No juvenile ash was identified, so the eruption was determined to be phreatic. This eruption was similar to a geyser eruption: periodic vertical ejection of the gas, ash, and steam. Ejecta didn't fall more than 30-40 m from the new crater. The surface of Hot Lake was covered by rocks with diameters of 20-30 cm, and ashfall deposits were concentrated to the NW. The volume of erupted material was nearly 40,000-45,000 m3. Areas with rhenium mineralization (see BGVN 20:10) located on the dome were not involved in the eruption or covered by eruption products. The first phase of the eruption was over on 13 October. Figure 4. Photograph of the hot dome and dry lake area in the N part of the Kudriavy crater at Medvezhia prior to the 7-8 October 1999 eruption. Courtesy of G.S. Steinberg. Figure 5. 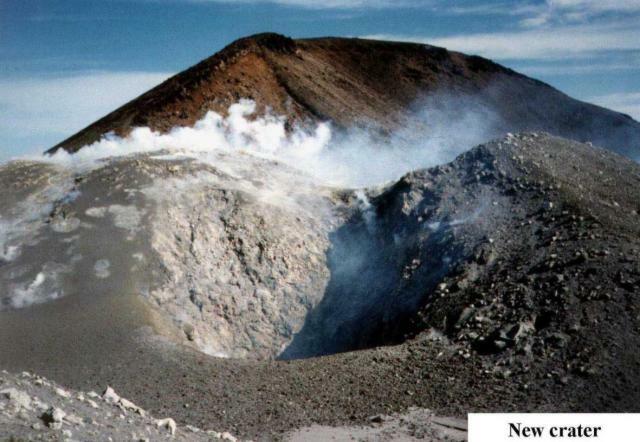 Photograph of the 7-8 October 1999 crater adjacent to the hot dome in the N part of the Kudriavy crater at Medvezhia, October 1999. Courtesy of G.S. Steinberg. Information Contacts: Genrikh S. Steinberg, Institute of Volcanology and Geodynamics, Russian Academy of Natural Science, Box 18, Yuzhno-Sakhalinsk 693008, Russia. 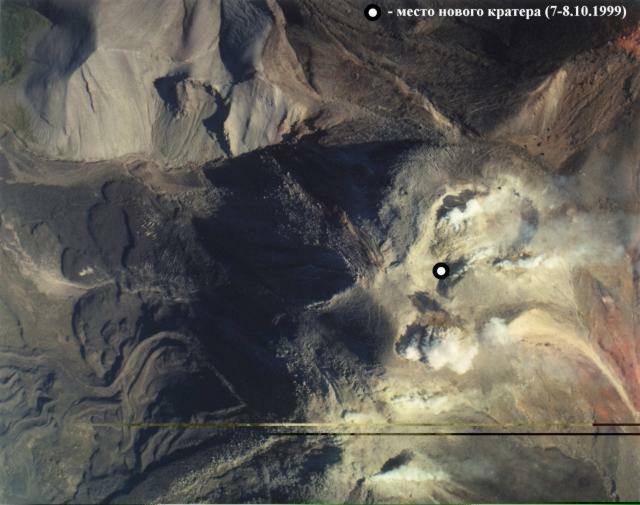 On 12 December SVERT reported that activity at Kudriavy, a stratovolcano of the Medvezhia volcanic complex, had not increased since 1 December. The Aviation Color Code was lowered to Green. On 27 November SVERT reported that during the previous 10 days a thermal anomaly and strengthening steam-and-gas activity were detected over Kudriavy, a stratovolcano of the Medvezhia volcanic complex. The size and intensity of the thermal anomaly increased considerably on 27 November. The Aviation Color Code was raised to Yellow. Diffuse steam-and-gas emissions were observed on 29 November. SVERT reported that a thermal anomaly was detected over Kudriavy, a stratovolcano of the Medvezhia volcanic complex, on 11 January. Strong steam-and-gas plumes were also observed. 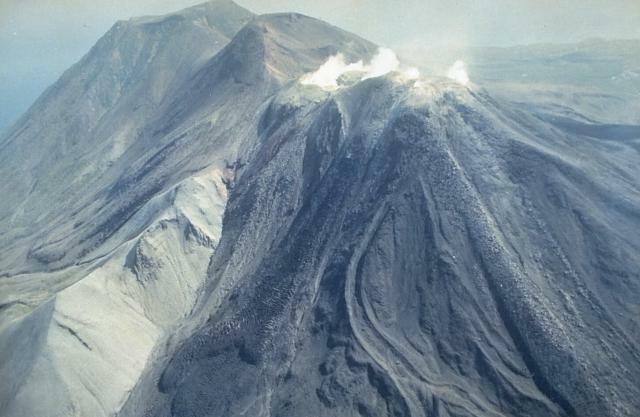 The 20 September 1981 aerial inspection [of the volcanoes in the S and central Kuril Islands] revealed intense fumarolic activity at five sites in Kudriavy crater. Information Contacts: G. Steinberg, Sakhalin Complex Institute. Intense activity from a few groups of fumaroles in Kudriavy's summit crater was occurring during a 6 November aerial survey. Sulfur deposits were noted around the fumaroles. East of the crater, on the outer dome slope, very intense gas emission (more active than in the crater) was observed. During a 14 January overflight, strong gas emission from Kudriavy's crater formed a cloud that reached 300-400 m above the summit. The inner part of the crater was not visible. Fumarolic activity was intense during fieldwork in late 1992. The maximum fumarole temperature measured August-October 1992 was 910°C (figure 1), and rocks at 20-30 cm depth glowed red. CO2-rich gases were sampled in August 1990 (table 1). Figure 1. 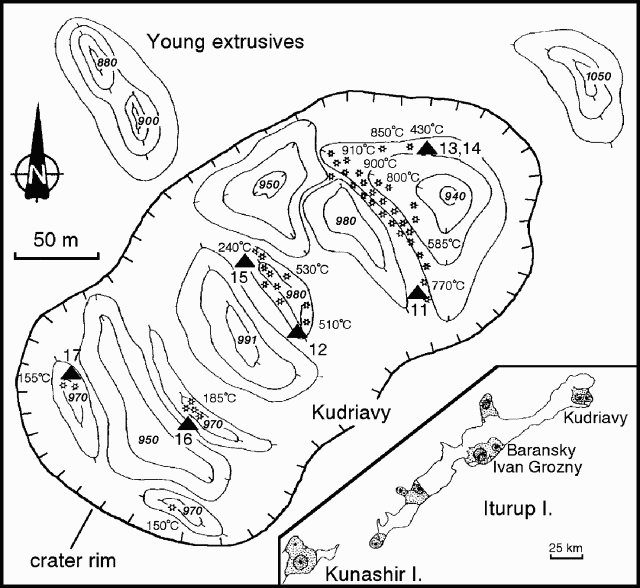 Sketch map of the summit area of the Kudriavy cone at Medvezhia, showing fumarole temperatures and elevations of some thermal features, August-October 1992. Contour interval is 10 m. Triangles mark collection sites for gas samples. The inset map shows Iturup Island, with locations of Kudriavy, Baransky, and Ivan Grozny volcanoes, plus the NE corner of neighboring Kunashir Island. Courtesy of G. Steinberg. Table 1. Fumarole temperatures, mole percent H2O, and volume percent of dry gas species from Kudriavy, August 1990. Data does not include N2, O2, or Ar. Sample localities are shown on figure 1. Analyses by U.A. Taran and U.A. Ignatorich. Data courtesy of G. Steinberg. The Kudriavy cone at Medvezhia has been the subject of great interest since Korzhinsky and others (1994) discovered a pure rhenium sulfide mineral in its high-temperature (535°C) fumaroles. Given the concentration of Re found in gas samples (2-10 ppb), the occurrence of ReS2 or Re2S3 (exact form still uncertain) requires enrichment of Re by eight orders of magnitude. During a 21 August-5 September visit, Stan Williams, Tobias Fisher, and Russian colleagues made COSPEC measurements of SO2 flux. Gas samples were also collected from crater fumaroles. The COSPEC was operated from the base camp (150 m elevation) 2.7 km SE of the elongate ENE-WSW summit (990 m elevation), while the wind velocity was measured at the summit using a hand-held anemometer. The first measurements were made on 28 August in vertically oriented stationary mode with the wind blowing the wide gas plume directly over the camp. Wind velocity was measured at 3 m/s and the plume was estimated to be rising only 50 m above the summit before being blown downwind. The flux was found to be 100 +- 20 metric tons/day (t/d) for the three measurements possible before the wind shifted to the SW, making any measurements essentially oblique to the plume axis, and therefore of great uncertainty. An occasional strong odor of H2S was detected at the camp during measurements. During a crater visits on 29 and 31 August, and during a helicopter flight downwind in the plume, there was always a strong odor of H2S. Under clear skies on 31 August the wind carried the plume SW, allowing stationary mode vertical and horizontal measurements. One specific goal of the research was to quantify the output of the isolated fumarole fields with different temperatures, which was possible for part of the day. Wind velocity was measured at 3 m/s and the SO2 flux was calculated to be only 30 +- 10 t/d. Kudriavy has been consistently degassing passively at high temperatures since at least 1961, when it was first visited by Russian scientists; annual fieldwork began in 1989. No change in activity was noted during this visit. At the low levels at which Kudriavy was found to be degassing, a realistic SO2 norm may be 75 +- 50 t/d, with the oscillations potentially reflecting meteoric conditions. These low-pressure fumaroles, some with temperatures up to 950°C, produced hissing to roaring to deafening levels of noise. 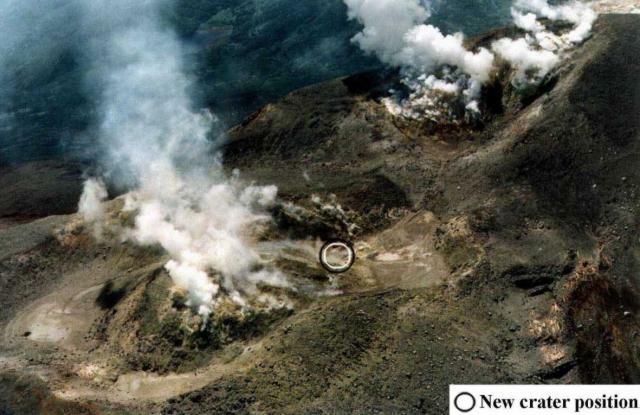 There was more noise and higher flux than at Momotombo (Nicaragua), where 950°C fumaroles were studied through the early to mid-1980s by U.S. and Russian collaboration. Reference. Korzhinsky, M.A., Tkachenko, S.I., Shmulovich, K.I., Taran, Y.A., and Steinberg, G.S., 1994, Discovery of a pure rhenium mineral at Kudriavy volcano: Nature, v. 369, p. 51-52. Information Contacts: Stanley N. Williams and Tobias P. Fischer, Geology Dept., Arizona State University, Tempe AZ 85287, USA; Kirill I. Shmulovich and Mikhail A. Korzhinsky, Inst. of Experimental Mineralogy, Russian Academy of Sciences, 142432 Chernogolovka, Moscow District, Russia; Genrikh S. Steinberg, Inst. of Volcanology & Geodynamic ANSRF, 693008 Yuzhno-Sakhalinsk, Box 18, Russia. The Moyorodake volcanic complex (also known as Medvezhia) occupies the NE end of Iturup (Etorofu) Island. Two overlapping calderas, 14 x 18 and 10 x 12 km in diameter, were formed during the Pleistocene. The caldera floor contains several lava domes, cinder cones and associated lava fields, and a small lake. Four small closely spaced stratovolcanoes were constructed along an E-W line on the eastern side of the complex. The easternmost and highest, Medvezhii, lies outside the western caldera, along the Pacific coast. Srednii, Tukap, and Kudriavy (Moyorodake) volcanoes lie immediately to the west. Historically active Moyorodake is younger than 2000 years; it and Tukap remain fumarolically active. The westernmost of the post-caldera cones, Menshoi Brat, is a large lava dome with flank scoria cones, one of which has produced a series of young lava flows up to 4.5 km long that reached Slavnoe Lake. Eruptions have been documented since the 18th century, although lava flows from cinder cones on the flanks of Menshoi Brat were also probably erupted within the past few centuries. Botcharnikov R E, Shmulovich K I, Tkachenko S I, Korzhinsky M A, Rybin A V, 2003. Hydrogen isotope geochemistry and heat balance of a fumarolic system: Kudriavy volcano, Kuriles. J. Volcanol. Geotherm. Res., 124: 45-66. Ermakov V A, Steinberg G S, 1999. Kudryavyi volcano and the evolution of Medveshiya caldera (Iturup I., Kuril Is.). Volc Seism, 21: 307-338 (English translation). There is no Deformation History data available for Moyorodake [Medvezhia]. There is no Emissions History data available for Moyorodake [Medvezhia]. Medvezhia, an eroded 8-km-wide caldera at the NE tip of Iturup Island, contains a complex of several cones and lava domes. Four closely spaced volcanic cones lie on an E-W line. The easternmost and highest, Medvezhii cone (upper left), lies outside the caldera, along the Pacific coast. Srednii cone (center), which has produced lava flows that reached the coast, is located immediately to the west. 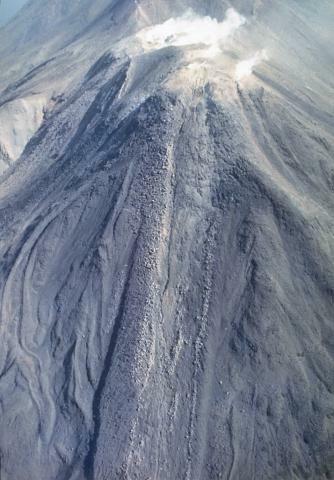 The slightly lower, historically active Kudriavy cone (right center) has fed youthful-looking lava flows that reach the caldera wall. Photo by T. Vendelin, 1990, (courtesy of Genrich Steinberg, Institute for Marine Geology and Geophysics, Yuzhno-Sakhalinsk). Youthful-looking lava flows, many with prominent marginal levees, descend the west flank of Kudriavy, a post-caldera cone of Medvezhia caldera. Kudriavy, one of four cones constructed along an E-W line, is capped by two shallow craters. The western crater has fed a prominent, thick lava flow, and numerous other lava flows blanket the flanks of the cone and extend 2-3 km to the caldera walls. 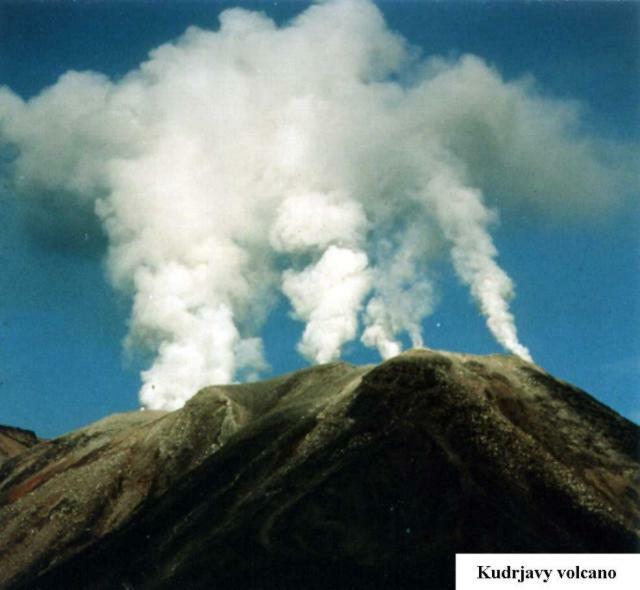 Kudriavy is the only historically active center on Medvezhia; it produced eruptions in 1778 or 1779, 1883, and 1958. Photo by T. Vendelin, 1990 (courtesy of Genrich Steinberg, Institute for Marine Geology and Geophysics, Yuzhno-Sakhalinsk). Large Eruptions of Moyorodake [Medvezhia] Information about large Quaternary eruptions (VEI >= 4) is cataloged in the Large Magnitude Explosive Volcanic Eruptions (LaMEVE) database of the Volcano Global Risk Identification and Analysis Project (VOGRIPA).